Hello, has anyone ever put baby moons on their ride? I'm in an '85 Bonneville with the original wheels, I believe they are 10 1/8" nubs. Does anybody have a recomendation on where to get a set? I know Mr. Gasket sells a set with very mixed reviews, but they are cheap (working on a college student budget). I realize this is probably the wrong thread for this, but I couldn't find much else on wheels. 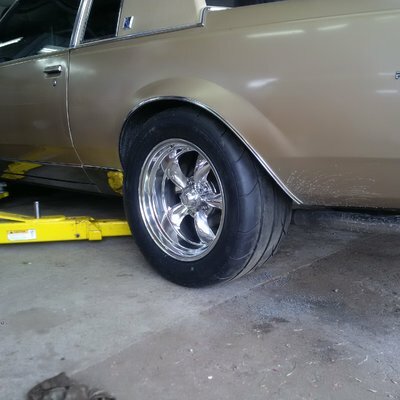 Horner, I have a set of 17 x 9.5's with 275/40's on them that I would love to mount on my 83 Monty. Are you running the 5.5 BS on the front end too? 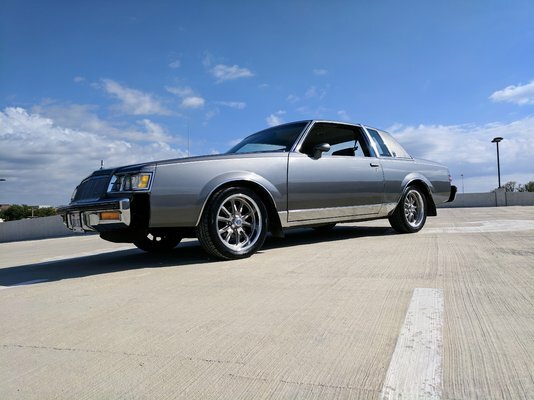 83 Monte Carlo SS, Edelbrock 425 HP roller motor kit. Pete Jackson gear drive, the quiet version. TCI TH350 2800 stall with shift kit. Flowmaster's dump in front of axle. 342 posi with Weld Drag Pro's with 275's on the rear. 38K on the body and 17K on the drivetrain. T-tops and no air. Is anyone running 17 x 9.5 Vette wheels? 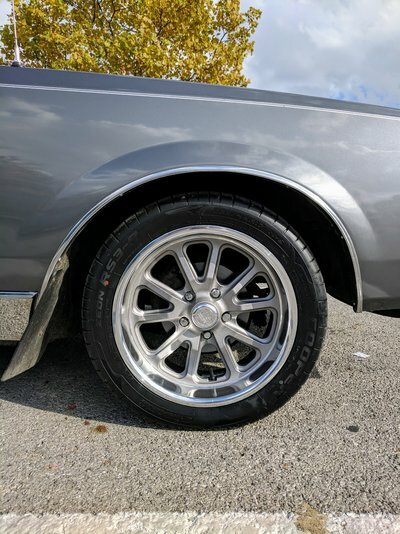 Will a 9.5 wide wheel fit on the front of an 83 Monte SS? No issues at all and couldn't be happier with the setup. Most likely lowering in the future. Something that will fit the muscle car style I'm going for and won't look bad on matte black. The wheels I got going on right now are waay too small. Looks good, do they fill the wheel well all the way to the lip, any rubbing? That is a beautiful H/O you got there!!!!! Care to share some mor specs on it. Took a while to get through all 27 pages. I have a 1979 Monte that has had 15" Ultras that look like American Racing "Gamblers." With a recent engine upgrade I'm looking to move to a tire with a little more "bite." However, as discussed throughout this forum, it has become difficult to purchase performance tires in a 15". So, I've decided that after 20 years it is time to upgrade her shoes. I have two questions really. 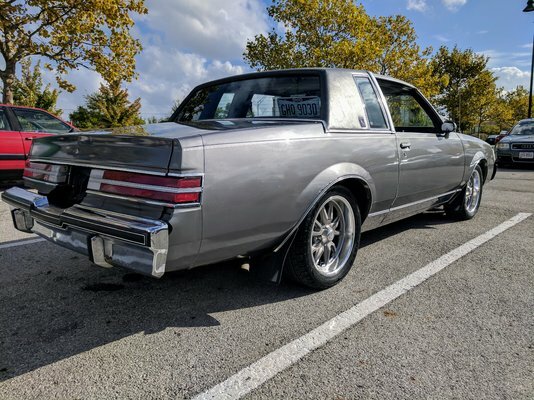 First question: Are the fender tolerances on my 3rd Gen Monte similar to the rest of the G-body family? I've been looking through here and it looks like you can fit quite a bit of wheel under these. 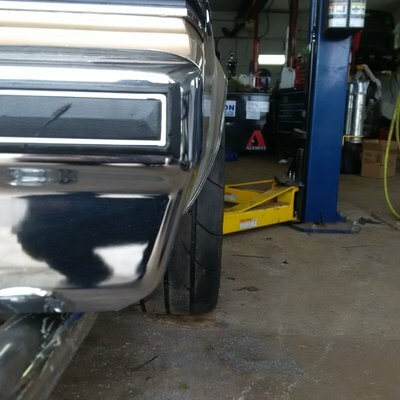 I want to fill up the fender wells on all four corners. I have to admit that the math you guys have figured out is pretty impressive, but it makes my head swim a tad! Some details: A few years back I installed a Hotchkis suspension kit that lowered the ride height about 1.5-2in. While I am looking to modernize the look a tad, I want a LITTLE sidewall in the back, but nothing like I'm running now. How big can I go in the wheel and tire dept? Was thinking either 17s all around or 17s in the front and 18s in the back. Anybody got pictures of their 3rd Gen with 17s or 18s tucked up inside? Did you have to roll the rear fender lips? Looks like 4.5' backspacing seems to be the norm? Something 9in wide should be OK as well? 9.5in wide? I'm not concerned about all four being the same size as I don't rotate them anyway. What additional info can I provide? Second question. I have my WHEEL choices narrowed down to five. All are modern editions of more classic styled wheels. I am struggling to find pictures of any 3rd Gen Monte Carlos with these wheels on them. Anybody have any? If not, how about a solid shot from a similar G-Body?